If people in wheelchairs can’t go to parks, shopping centers, or hotels because they don’t have ramps, for example, then they won’t be seen in public. If they aren’t visible in public, most people don’t see them. If people don’t see people with disabilities, they don’t merely assume that they can’t do anything useful: They don’t see them at all. On December 26, 2004, the deadliest tsunami in human history killed almost a quarter of a million people in thirteen countries in less than thirty minutes. More than half of these people died in Aceh, an Indonesian province that had for decades been isolated by a violent and ugly conflict between the separatist movement and the Indonesian armed forces. More than half a million people’s homes were destroyed by the waves. Entire communities were wiped off the map. The destruction of entire towns and villages and the displacement of hundreds of thousands of people were followed by the most ambitious reconstruction operation in history. With mottoes such as “Build Back Better,” and with access to huge amounts of funding, many of the agencies and organizations involved in reconstruction engaged in many forms of social engineering. Organizations such as Handicap International lobbied hard for public facilities such as meeting places, schools, and mosques to be rebuilt to allow universal access. This organization pushed for buildings to be designed to meet the needs of “people of all ages, sizes and abilities.” This included the disabled. According to the 2000 National Survey, the number of people with disabilities living throughout Indonesia was almost 1.5 million, less than 1% of the total population. This compares to a World Health Organization estimate that around the world, approximately 10% of the world’s population is significantly disabled. 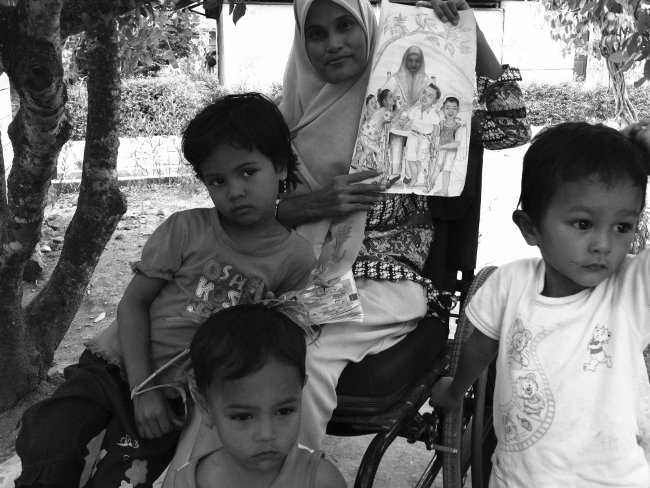 Throughout Indonesia, many factors contribute to this systematic under-reporting of the number of disabled people. Many disabled people are simply not visible. They are often excluded from the everyday life of their communities, they are unemployed, they remain at home, or they are entirely without identity documents and are not registered with government authorities. In Indonesia, people with disabilities are often excluded from full participation in society by lack of access. People with physical disabilities may have difficulty attending school. Without educational qualifications, they are even less likely to be able to find work. Access to offices, factories, and other workplaces may also be limited. Because people with disabilities can’t work when no accommodations are made to their needs, they become poor. People see the poor in wheelchairs or on crutches, and assume that they are poor because they can’t do anything useful. If they can’t do anything useful, this line of reasoning goes, then it would be a waste of resources to create special facilities for them. Yet if people can’t leave their homes, they can’t use public facilities. If people in wheelchairs can’t go to parks, shopping centers, or hotels because they don’t have ramps, for example, then they won’t be seen in public. If they aren’t visible in public, most people don’t see them. If people don’t see people with disabilities, they don’t merely assume that they can’t do anything useful: They don’t see them at all. The concept of universal access is based on the belief that when appropriate accommodations are made for people with disabilities, the limits on their activities are eliminated or reduced. When the limits on people’s activities are eliminated or reduced, they are no longer disabled, because they can participate in a full range of activities in the community in which they live. Some of the major reconstruction efforts in Aceh paid attention to the plea by such organizations for universal access. UNICEF rebuilt 300 schools and repaired another 200 damaged schools throughout Aceh. These schools were built according to universal design principles and were intended to be accessible for children with disabilities. The United Nations Development Program promised to facilitate the construction of 400 houses specifically designed to be accessible for people with disabilities. A few highly visible public buildings, such as the Oman Mosque and the Taman Sari public park in Banda Aceh, were also designed and built to allow universal access. Handicap International involved architects and architecture students from local universities in the design and reconstruction of these buildings. Through their participation in these projects, they became aware that simple adaptations in building design and construction could improve access for people with a range of disabilities. It is not enough to build accessible buildings and other facilities. Often, people who have been excluded from participation need special care, instruction, and guidance in order to make use of available facilities and to achieve their full potential. For this reason, Handicap International and the small handful of organizations that work with people with physical disabilities in Aceh sponsor the donation of wheelchairs and prosthetic limbs in certain districts to people who need them. Handicap International is also involved in training and economic empowerment programs. These often dramatically change the lives of those receiving training and guidance. By helping people with disabilities to achieve their full potential, these programs also change the way the rest of the society views them. When enough people become aware that the disabled can make significant contributions, then the community may be prepared to devote the resources required to make it possible for them to make these contributions. Nurbaidarmi with some of the children who admire her hand-painted books and pictures. Photograph by Poriaman Sitanggang. Copyright 2010 Poriaman Sitanggang / PNPM Peduli. I am a little flower. I grow among the grass, where the wind and the rain greet me. I’m a paraplegic. I’ve got no idea how I became this way. When I was at school, I used to love sport. I was the strongest girl in the class. I used to love running. I was always in the school sport competitions. There were times when I fell and hurt myself, but I don’t remember the fall that paralyzed me. When I was fourteen, I suddenly had excruciating pain in my back. Then I had a terrible fever. Suddenly, I couldn’t move my legs. I couldn’t even feel them. It felt like they were dead. My father took me to the hospital in Banda Aceh. I stayed there for seven days. The doctors didn’t know why I wasn’t able to move. They sent me to Medan, where the hospitals are better. I was in hospital in Medan for fifteen days. When I was in the hospital, I heard one of the nurses say “She’s such a pretty girl. It’s too bad she’s paralyzed.” That was how I found out that I’d broken my spine. I remember shouting at my father and telling him what the nurse had said. I remember telling him it wasn’t true. And then I didn’t want to talk to anyone. I couldn’t bear it. I remember my father telling me that he’d get me a wheelchair. I didn’t want it. I hated my father even for suggesting it. I just lie on a mattress in my room. I have no control over my bladder. I can’t stop myself urinating. I have to change my clothes ten times a day or even more. I’ve hardly got any meat left on my legs, so my bones always rub straight against the mattress. I get sores all over my body. They often get infected. Sometimes I get sick from the infections. The most disgusting thing is the rats and insects. They nibble and gnaw on my toes. I can’t feel them doing it. I wrap my feet up with cloth so that the rats can’t get to them, but they chew their way through the cloth. I have to always watch my feet and protect them. My father told me about the special school in Banda Aceh. It was a school for people with disabilities, but I wasn’t interested. I was ashamed of urinating uncontrollably in front of other people. I didn’t know that loss of bladder control was a problem that all paraplegics have. No one ever told me that. I thought it was just me. So I didn’t want to go to school. I just stayed in my room. Most of the time, I listened to the radio. I liked reading, too. I read anything that I could get my hands on, magazines, newspapers, books. I liked reading about people in wheelchairs in the paper. I didn’t have any disabled friends and I never went out of the house, so that was how I learned about how other people like me coped. I didn’t use a wheelchair for years. As time went by, I began to accept my situation. In 1990, I let my father buy me a wheelchair. There was no path at the front of the house, so I couldn’t go anywhere. At least I could sit outside. Sometimes friends or family came to visit me. I started to enjoy being with people again. I started to draw, too. I had plenty of time. I just taught myself how. The kids around here used to watch me drawing and they always asked me to give them drawings. That was how I filled my time. Things changed after the tsunami. A lot of foreign NGO’s and aid organizations came to Banda Aceh after the tsunami. My brother was working in town. He met someone who told him about Handicap International. They had a program to provide wheelchairs to people who needed them. I’ll be honest with you: I was very suspicious at first. I’m Acehnese. I’m a Muslim. I didn’t want to ask the foreign NGO’s for anything. I thought they might want me to become a Christian if they gave me something. But my brother encouraged me. Some people from the organization came out to meet me. They asked me a lot of questions. They asked me what I wanted to do with my life. They asked me what I wanted to do after I got my wheelchair. They came out to my home more than six times to interview me. My mother asked me: Why don’t they just give you a wheelchair? Why do they keep asking all these silly questions? But the people from Handicap International wanted to know about my house and how I lived there. They offered me a grant to make my house more accessible. They asked me if I needed to have better access to the bathroom. They suggested making the floor flat and widening the door. But I told them that even more important than the bathroom, I wanted somewhere where I could wash my own clothes. My mother is getting old. She was getting too old to keep on washing the clothes that I’d urinated on. Once she fell over while she was carrying them. I couldn’t do anything to help her get up. I was so ashamed. I said if there was money available to reconstruct my house, I wanted to be able to wash my clothes. The people asked me to draw a plan to show what I wanted. They suggested a few changes to make my plans more practical. They built a low basin outside my room. They also built a paved path so that I could get my chair to the road in front of my house. The people from the organization told me that if I had a wheelchair, I should think about what I wanted to do after I got it. They asked me if I’d thought about getting a job. I laughed and told them that no one would employ an unqualified woman in a wheelchair. They told me just to imagine that I could do anything I wanted. I didn’t take it seriously. I told them I liked playing with children. I liked drawing. I said I’d like to be a teacher. They told me about an early child care and education course being held by UNESCO, a twenty-five-day course. I still didn’t think I could do it. I told them that I was scared that I’d urinate in front of the other students. They told me about diapers for paraplegics. They said if that was the only problem, they’d get the diapers for me. I was the only disabled person in the course. There is a play group in the village about a hundred meters from my house. When I finished the course, I started working there as a volunteer teacher. I don’t get a salary. Sometimes I get cash gifts from the school authority or from parents. The kids like me. I draw pictures and write stories to go with them. I read the stories to the children. I’ve never published them. I just give them to the kids in my neighborhood. They are always asking me for them. But I haven’t taught at the school for the past three months. The village authorities began repairing the road outside my house. They put stones there to stop the road being washed away. It means that I can’t push myself to school in my wheelchair anymore. Could they have made a special path along the road for me? [Laughs] I’d be embarrassed to ask for something like that. They’d have to go to all that trouble just for me. No, you’re right, it wouldn’t have cost much. They could have just left a strip next to the road without stones. I’ve never been to any village planning meetings. Someone would have to carry me. I’d be embarrassed to go and talk to the village head and ask him for a special favor. The head of the playschool and the other teachers didn’t realize. I don’t think they could have done anything anyway. Anyway, a lot of the kids still come to visit me at my house. I still do my drawings and tell them stories.